When we found out about this pregnancy, we both knew that we wanted a different experience. We enjoyed the end game with our first, but it was a rough labor and this time around, we wanted a more relaxed environment. After reading so many great reviews, we made the choice to deliver our son at Central Texas Birthing Center. Our initial appointment was with Heather! She let us tour, and we talked about what I wanted for this birth. Mind you, the center was actually closed that day and she made time for me and my family. That was so important. She was so understanding and reassuring that we would get what we wanted and then some. She was definitely right. 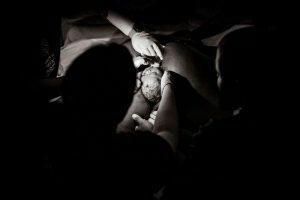 We met with midwife Randi, and INSTANTLY made her our primary midwife. To be honest, it was her daughter who sold us. Lol. She was a care free nudist who could hold a conversation lol. Randi listened to all of my vent sessions and understood what we were up against with the birth rates among African American women. Randi and Heather helped me come up with a diet plan, tinctures, and teas to make sure this pregnancy was smooth sailing. We also got a doula this time around. Darlene gave me sooo much insight on things she learned along the way, and provided emotional support. We needed that more than we thought. Especially since we started to think I was going to go over 41 weeks. She was always my voice of reasoning, and that too was very important to me. On July 11th, we went in for a routine appointment. I was 40 weeks 4 days. I got checked for dilation and learned I was a 4. The week before we couldn’t get to my cervix at all because my sons head was basically blocking it. Randi stretched me to a 5 and was told to start the cotton root tincture after my ultrasound. To be honest, after she stretched me, I started having contractions. I actually went up to my job and visited old co workers and friends all while contracting a little. Came home after the ultrasound and started the tincture (cotton root) 1 dropper full every 15 mins for 2 hours. Around 6pm I started to feel a little more uncomfortable and just wanted to labor a while in the my tub at home. I started feeling a little better and even got the strength to talk on the phone to one of my closest friends. I was able to eat dinner, and watch a few shows before my contractions started coming every 7 mins lasting for 30-45 seconds. I decided to go for a walk around my neighborhood. I made it all the way down one street before I told Josh I needed to get back to the house. 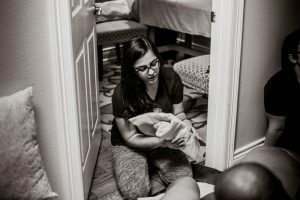 I got back into the house and made sure I had everything I wanted to take to the birth center all while contracting and keeping my midwife updated. My best friend called and the whole family was cheering me on. 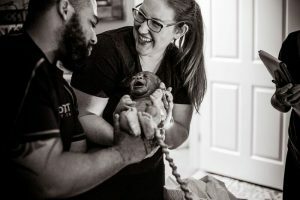 I got out maybe a sentence before I told my husband that I was ready to go.He called my birthing team and we dropped our daughter off and headed to the birthing center. This was around 10:40pm. While driving to the birthing center, we prayed. We both talked about coming home as a family of four and listen to one of my favorite songs to get me excited for what was to come. We made it to the birth center around 11:30 and my contractions were five minutes apart exactly. Randi and Heather greeted me before I got out the car and helped prep me for all that was about to come. I was a little nervous, but seeing them both reassured me I was going to be fine. I leaned on them a lot. 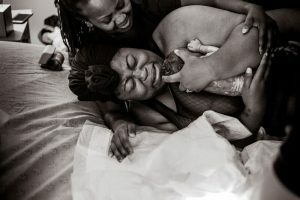 Shortly after settling in,my doula and birth photographer arrived. I’ll say for maybe the first hour and half I was there, I was doing pretty well. I was laughing with my doula and birth photographer, even singing along to my birth playlist. That tub was relaxing and definitely helped with pain management. Eventually things got a little more intense. It seemed like I couldn’t find comfort anywhere and anyone who attended my birth will tell you I labored in almost every room lol. There came a time where I didn’t think I was gonna be able to give birth at the center. I was in pain, angry, and felt like I was against all odds. I told them to call the hospital and let me go. 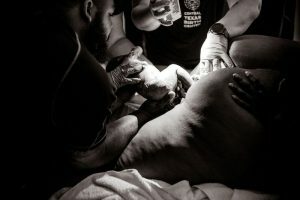 My husband knew I didn’t want that from my previous birth prep talk and just told everyone to let me say and labor the way I needed. He had all the faith in me and I’m so grateful everyone listened to him. As for me I would’ve ran out the door if they let me lol. I went from 8 centimeters to a 9 in a matter for 45 mins. Everyone wanted me to get back into the tub and luckily I did. It felt great all for a little while until one of my contractions literally made me jump out the tub. I yelled and screamed I couldn’t do it anymore and before I knew it, I jumped on the bed on all fours and my water broke. Ronan was coming and I had no choice but to accept it. 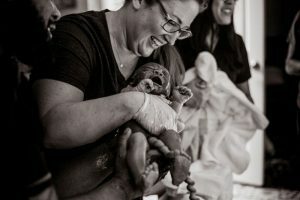 I screamed my child right into my husbands hands 3 hours after arriving to the birth center. I’m so grateful for everyone who helped make this birth possible. It was one of the most rewarding things I’ve ever done.